Join us for Buddy Training Wednesday mornings! For the safety and welfare of all dogs, NO puppies under 12 weeks of age are allowed in our training facility. Welcome to the Dog Training Club of St. Petersburg! We have PUPPY and Manners Classes enrolling now! We offer classes in all levels of obedience (Puppy through Utility), Agility, Rally, Flyball, Nose Work, Tricks, Conditioning and more. All of our classes are open to the public. Classes are taught with positive methods. DTCSP is MORE than just classes. 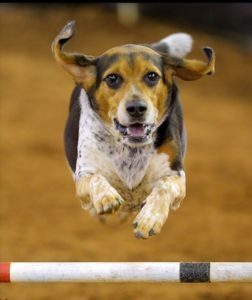 We are an extremely active club - hosting multiple agility, obedience and scent work trials every year as well as flyball tournaments and seminars and workshops on a variety of topics. We perform demonstrations at community events, support local rescue organizations and send multiple teams to the state agility and obedience competitions (DACOF and DOCOF). Our members compete in huge variety of dog sports - there is something for everyone here! The Dog Training Club of St Petersburg (DTCSP) has been actively training dogs for over 60 years. We are an all volunteer organization, our purpose is to share our knowledge and experience to help the community to train their dogs. We have experience and dedicated instructors who bring their knowledge and experience to their students. You are welcome to stop by Monday - Wednesday between 6:00 pm - 8:30 pm or Tuesday mornings between 9:00 am and 10:30 am. Watch a class, talk to our instructors, see dogs training at various levels. Stop at the front desk and we will be happy to give you a tour and discuss your particular training needs. One of the best ways to build a healthier relationship with your dog is to understand how your dog learns and use the principles of positive training to make learning as rewarding, successful and easy as possible. Dogs that are taught using positive reinforcement methods are more tolerant, self-controlled and behave much more predictably in different situations. Increasing your dog’s enjoyment of social interaction will give her the confidence to deal with the pressures of domestic life. Training your dog to have good manners and behave well in different situations requires effort, but consistent commitment ensures success.We have high expectations for our dogs, encouraging them to be friendly with everyone they meet, even if they are uncomfortable in certain situations. It is therefore vital to socialize your dog by giving her good experiences in the presence of all kinds of people, animals and environments. Training your dog builds up a language of communication between you that promotes security and comfort. The more time you invest teaching your dog to live successfully in a human world the more you will avoid problem behaviors that come from lack of understanding. . 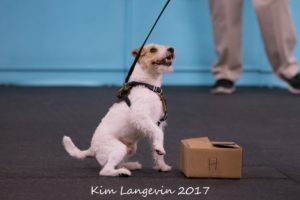 Positive reinforcement does not mean you do not mark your dog’s misbehavior, just that the ‘discipline’ should be used as constructive guidance rather than as an intimidation technique. Guiding your dog into making the right choices and understanding what she needs to be happy will help increase the bond between you.